The first four books in Lauren Willig’s Pink Carnation series introduced us to Napoleonic-era espionage, flower-named spies, and a host of charming and not-so-charming but unforgettable characters. And the adventures continue with a trek through India’s wilds, a Christmas pudding, and a cameo of Jane Austen herself. The Temptation of the Night Jasmine, The Betrayal of the Blood Lily, and The Mischief of the Mistletoe are, like the rest of Willig’s historical romances, crazy fun reads. After seven novels, one might think the series concept of Napoleonic-era spies would get old, but no. One of the best things about these book is that each novel features a new hero and heroine, one or both of whom have appeared as minor characters in previous books—and these prior protagonists turn up again as side characters in later books. It’s like going to a class reunion or a rural county fair, meeting all these beloved or familiar faces in each new book. To tie it all together, each book (with one exception) is a new chapter in the life of Eloise Kelly, a present-day grad student who is researching all of these spy characters for her dissertation, and her adventures in finding a love of her own. 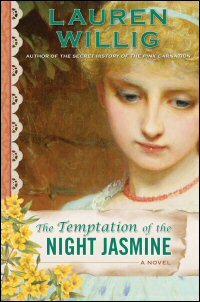 The Temptation of the Night Jasmine features Charlotte Lansdowne, the shy granddaughter of a ferocious cane-wielding dowager duchess with plans to marry Charlotte off to the highest bidder. Too bad for the duchess, but shy Charlotte isn’t very good man-bait, more interested in fanciful novels than dalliances on ballroom balconies. But when her distant cousin Robert, Duke of Dovedale, returns from India, Charlotte finds herself swept off her feet…and swept into the dangerous schemes of the notorious Hellfire Club, which Robert is bent on infiltrating. A favorite side character of mine ever since she appeared with Henrietta in The Masque of the Black Tulip, I was pleased to see Charlotte—and her dashing duke—get a novel of her own. Charlotte may be shy and quiet, but she has a strength built from years of enduring her harsh grandmother, and a sweetness all her own. 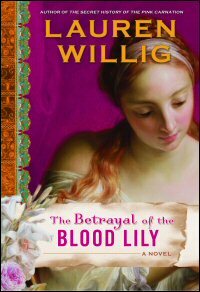 In The Betrayal of the Blood Lily, Charlotte’s friend Penelope Deveraux finds herself just where people kept telling her she’d end up—in disgrace and married hastily to a man who was much more charming before she had to marry him. Although nobody said anything about India! But when her husband is offered a position there, to India she must go…where she meets Alex Reid, a man nothing like her husband—and a man nothing like her husband is just what she wants but cannot have. As in her earlier novel The Seduction of the Crimson Rose, in this book Willig takes a character I wasn’t very fond of in earlier books and makes her compelling and sympathetic. The Mischief of the Mistletoe is just so much fun! 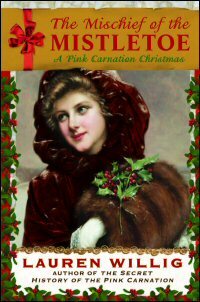 It may well occupy my second-favorite-in-the-series slot…which is funny, because I was one of the few Pink Carnation fans who was skeptical about a novel featuring the handsome but bumbling Turnip Fitzhugh. Throughout the series, Turnip has always cracked me up with his strange and unwittingly hilarious comments and manners of speech, but Turnip as a romantic hero? Well. Shows how much I know. In The Mischief of the Mistletoe, Turnip wouldn’t know love if he knocked it over and squashed its foot with a Christmas pudding, which is exactly what he does. And soon enough, he and schoolmistress Arabella Dempsey discover that Christmas puddings aren’t always as innocent as they seem, for this one is wrapped in muslin printed with a secret message. Poor Turnip, often mistaken as the famed Pink Carnation, has just bumbled his way into a bona-fide spy adventure! And Arabella discovers that Turnip, like Christmas puddings, is more than what he seems. The Mischief of the Mistletoe is the only book thus far which doesn’t include snippets of grad student Eloise’s life in the present day. (I guess Eloise doesn’t know about Turnip’s Christmas pudding.) Though this book takes place out-of-sequence with the rest (before and during the first part of The Temptation of the Night Jasmine), I would like to have seen some Eloise chapters, anyway, as if she were discovering an out-of-sequence bit of info for her research. But with Jane Austen as a secondary character, who can complain? And I must admit that the Eloise chapters aren’t as exciting as they used to be. In early novels, where she and Colin were just getting to know and flirt with each other, there was so much more thrill. In The Temptation of the Night Jasmine and The Betrayal of the Blood Lily, the tension starts to slide in the Eloise chapters, and in the romantic tension’s place is Eloise’s weird theory and frantic nosiness about Colin’s job. It just doesn’t work for me. But I really like Eloise. I want her chapters to work! The Temptation of the Night Jasmine and The Betrayal of the Blood Lily are in bookstores now, but The Mischief of the Mistletoe isn’t out until October 28. Although there are benefits to reading the books in order, it is by no means a necessity, so if one appeals to you more than the others, just dive right in. These are light-hearted, witty, and page-turning books, great for Regency history and Austen fans everywhere. Tia here. Just a reminder that all commentors are automagically entered into my Amazon Review Drive Giveaway – Phase II! Details on sidebar! I’ve been saying for years that comic characters are under-used as romantic heroes. I feel totally vindicated now. 🙂 Also, I’m glad you brought this series up again. It’s one I wanted to look into, then got distracted. I’m only two books into this series, but I am loving it! It does sound a lot of fun!